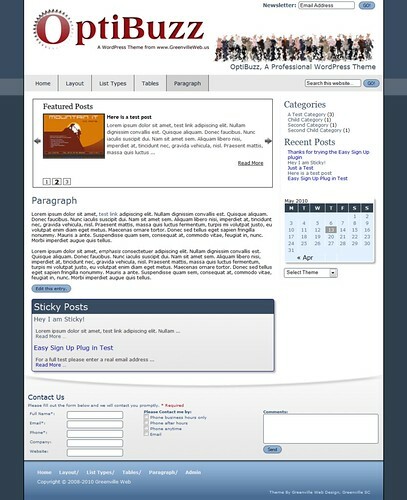 Upload the theme folder via FTP to your wp-content/themes/ directory. Select Opti Buzz WordPress theme. Upload the Smooth Slider plug-in via FTP to your wp-content/plugins directory, and follow the directions from the plug-in page to activate it. 5. Inside your WordPress dashboard, go to Settings > Smooth Slider and configure the plugin to your liking. Please Note: The Opti Buzz WordPress Theme over rules the CSS for the Smooth Slider. Inside your WordPress dashboard, go to Appearance > Opti Buzz Options and configure the Theme to your liking. Logo and Header background files are included as a PSD. IMPORTANT: If you replace the file with a different file name or file type remember to update the style sheet.